I was just reading about the 37-mm 70K Naval gun that the Soviet Navy used for AA. I wanted to see how it compared to the Bofors 40-mm. These were both guns used on naval ships for anti-aircraft defense. One drawback was that the 70K required a barrel change after every 100 rounds fired. To improve on this, a twin-barrel water cooled mount, the V-11 (called "W-11" in East Germany and Poland because of different Cyrillic transliteration), entered service in 1946, and was in production until 1957. A total of 1,872 V-11 mounts were built. There was no citation for it. But...ouch, a barrel change every 100 rounds? Охлаждение АУ было воздушным и являлось неудачным: так у 37-мм ствола с воздушным охлаждением длина непрерывной очереди составляла лишь 100 выстрелов по сравнению с не менее чем 158 у ствола с водяным охлаждением. После 100 выстрелов ствол с воздушным охлаждением либо следовало заменять (на что требовалось не менее 15 минут), либо ждать его охлаждения около 1,5 часов. The cooling of the AU was air and was unsuccessful: for a 37-mm barrel with air cooling, the length of the continuous queue was only 100 shots compared to no less than 158 for a barrel with water cooling. After 100 shots, the air-cooled barrel should either be replaced (which took at least 15 minutes), or it should wait about 1.5 hours for it to cool. Again, it is uncited. But it does offer clarification on a few things. So now my obvious question is how does this part compare to the Bofors? What is the barrel change rate of the Bofors 40-mm gun? I did look for this on google with various keywords like "Bofors 40 mm barrel change" and "swap" and "overheat". It all came up nil. I hope someone here has a good idea on how to find this info. Terry Gander: "The Bofors Gun" reports that the 1930s land-based Bofors were air cooled, single barrel and supplied with two spare barrels to be exchanged by four men within a few minutes if overheating should occur. To be determined as needed. The naval version had water cooling from the start. (1) Guns become copper-fouled to less extent when cared for in the proper manner. Wear in the bore does not depend entirely upon the number of rounds fired but also on the care given the bore in cleaning and cooling between periods of firing. (2) Since the accuracy life of a gun is decreased by a fast rate of firing and the attendant heat, the gun should be allowed to cool and should be washed as often as practical. Barrel assemblies should be changed during firing whenever necessary because of overheating. Each projectile must be cleaned before it is placed in the rack preparatory to firing. The bore should be cleaned before firing. Similarly, the NAVY DEPARTMENT BUREAU OF ORDNANCE – ORDNANCE PAMPHLET No. 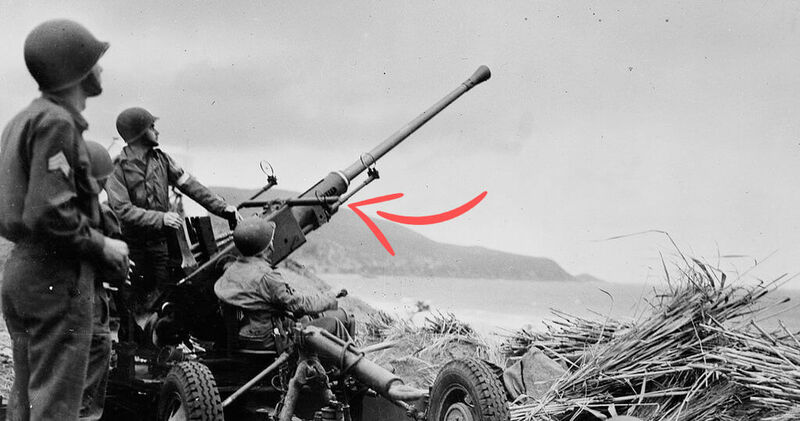 820 – 40MM ANTIAIRCRAFT GUN October 1943 remains silent on average intermittent barrel change rate d caused by overheating due to sustained firing. Even though the naval version was typically water cooled, mitigating the effects of overheating, the instructions only warn that it could overheat, eventually. And finally, compared to the Soviet gun: the barrels could be exchanged in 3 minutes instead of 15. Not the answer you're looking for? Browse other questions tagged world-war-two weapons navy or ask your own question. How did Nazi Germany produce such an impressive portfolio of officers for WW2? How were the holes for the guns in battleships' turrets protected?